Ancient Eleutherna is located at a distance of around 30 km. to the SE of Rethymnon and occupies two long, narrow ridges, called Pyrgi and Nissi. Three streams flow around the foot of the hills and join to the north of them. The urban centre of ancient Eleutherna was always located at Pyrgi. Ruins of Hellenistic walls and buildings, Roman structures and an Early Christian basilica are preserved on the east slope of the hill. On the west slope of the hill, at the site called Orthi Petra (standing stone), lies the cemetery of the Late Geometric and Archaic periods, part of which was covered by the Roman buildings. Remains of a settlement that flourished in the Hellenistic period have been uncovered on the Nissi hill. The first excavations on the site were carried out in 1929 by the British Archaeological School under the direction of H. Payne. 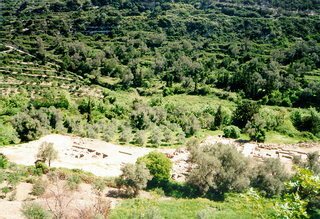 The area has been systematically excavated since 1985 by the Department of Archaeology and Art History of the University of Crete. Excavations are carried out in three sections of the site: a) Katsivelos, b) Pyrgi and Nissi hills, and c) Orthi Petra.